In November, early childhood teachers were talking about Thanksgiving and my food activities corresponded nicely with classroom lessons. I used toy food as it traveled well and could be used repeatedly. I know that I had as much fun as my students playing with this food. There is so much that you can do! Label the food and items related to food and tell the function of the items such as knife and pot. Answer WH questions such as "Why do we need a knife?" or "When do you eat pancakes?" Classify fruits, vegetables, food groups, and desserts. 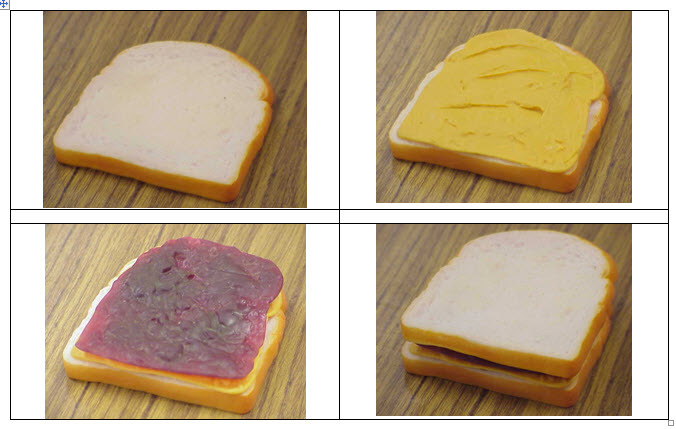 Sort and describe the food by colors, size, shape, and/or texture. Using toy food, make a peanut butter and jelly sandwich, cheese burger, or a hot dog - any food with parts will work. Take pictures as you put it together. Students can put the pictures in order and tell about the sequence. Make an overlay of the sequence to add to a communication device for your verbal and nonverbal students. Students can press the buttons for each step as they complete the sequence using toy food. Many will verbalize along with the device. I have often used devices in therapy as they make great models for increased utterance length, syntax, and articulation. So much better than me saying "Say ____." Encourage the use of he and she with dolls (or animals) representing a boy and a girl, two large plates, and a basket of toy food. Talk about the dolls and what they would like to eat/drink. "He /She is hungry/thirsty." "He/She wants _______." 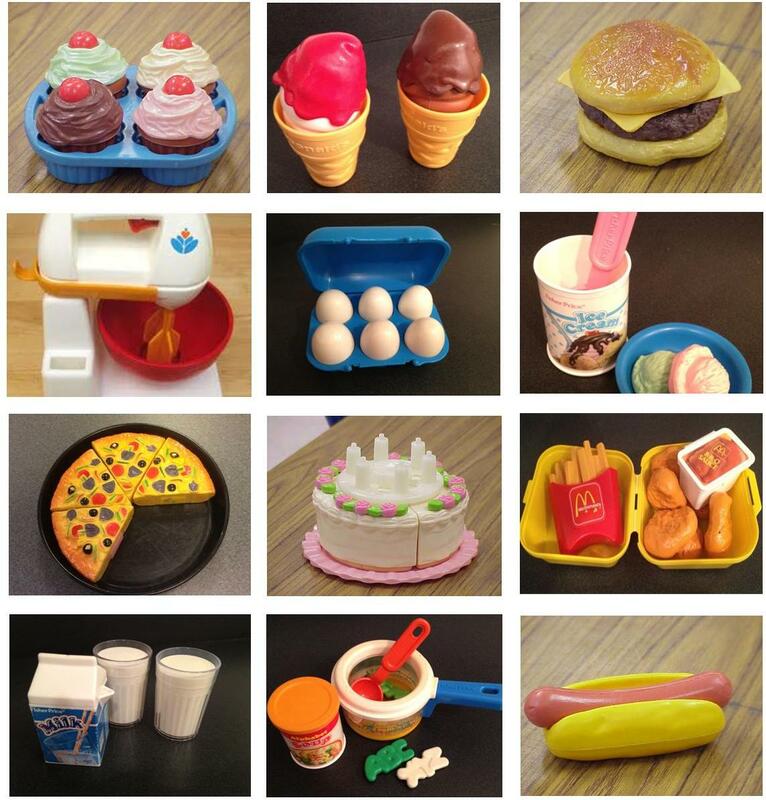 Label verbs and teach present progressive tense by taking pictures of students playing with food. Present the pictures in either print form or in digital form. Help students describe the actions in the pictures using the appropriate tense (Thomas is mixing., Sara is making a cheeseburger, Lila is cutting., etc.). Examples of actions include stirring soup, cutting pizza, mixing (toy mixer), cracking eggs, pouring milk, scooping ice cream, or making a hot dog, cheeseburger, PBJ, cake, cupcakes, fries and nuggets. Read a Three Bears Story and sort pictures of food, furniture, and animals. Practice using phrases with negation while sorting - "This is food" and "This is not food." Show the student pictures of food (or objects or real food) and talk about likes and dislikes to elicit sentences such as "I like apples." and "I don't like that." Set a table to get responses from a variety of commands and questions similar to those below. What color plate do you want? Wet, dry, soapy, towel, sponge, in the water, out of the water, sink, and float are only some of the concepts that you could teach when washing and drying dishes. With a few props, pretend play can allow for wonderfully spontaneous interactions. Restaurant – The waitress/waiter has to relay information to the cook. He wants pizza. She needs more milk, etc. Children can request from a picture menu. Grocery Store – Give children “picture lists.” Put "in" the basket or bag. Stock the shelves to put food "on the shelf." What did you buy? How much did it cost? Which one do you want? Bake a Cake - I had a toy cake and other needed toy items. Students cracked eggs, poured milk, stirred the batter, put the batter in the pan, scraped the bowl, baked the cake in the oven until the timer went off, mixed icing with a mixer, put the icing on the cake, and sang Happy Birthday. Look at my posts Playing With Food on Your Computer and Playing With Food on Your iPad for more resources.